This is a team we’ve played several times before, and it’s usually a close match, so the handicapping wasn’t a factor. It was close again, but we came up a little short. It was frustrating to be up 3-1 and end up losing the match, but we didn’t play cricket very well–and they played very well indeed–so we got what we deserved. Final score, a 7-6 loss. Next up, it’s the team we’re tied with for first place, Armed and Hammered. We lost in the finals last season. One day, I’m going to find out what their team name means. Playing against a strong team anchored by one of the best players in the league, we were satisfied with a 7-6 loss at their place. A good group of guys, and strong dart players. We caught them on an off night. An 11-2 win. Probably the best team in the league, perennial winners of the A Division. Inexplicably, they played poorly against us, and we’ll take it. A 10-3 win. Because so few teams compete in the summer league compared to the others, there is a wide range of talents in the division. To compensate for this and give every team a fighting chance, a handicap system is in place which starts weaker teams off with one or more marks in cricket, and a lower score in 501. Because of this, I’d predict that you’ll see wild swings in the standings throughout the season, as strong teams are by no means guaranteed to beat weaker ones. Tonight, we’re up against Good Strokes. Wish us luck! I received the stats report this morning, so those have been updated. We didn’t knock Good Strokes out of 2nd place, so they’ll have a home match against Office Cafe. We face Brennan’s tomorrow. Not a prospect I relish. Brennan’s beat us 10-3, our only loss, and we have a losing record against them this season. No stats have been sent to us yet, probably because there are teams still making up missed games. The main thing is that the top spot in the standings won’t change. We took our division this season. Tracks has gone from one of the worst places to play darts to one of the best, simply by removing some boards. They used to have six or seven matches going on every Tuesday, and there simply wasn’t room for all of the players. With three boards, there was plenty of space, and those who weren’t playing could actually watch the match. The staff is as friendly and attentive as ever, so it’ll be a place I’ll be looking forward to visiting again. Good Strokes are a terrific bunch of guys. They were very gracious in defeat, and effusive in their praise for our play. I think maybe they’d be a better team if they had a worse attitude. I had a very good 501 game early, and it seemed like after that they didn’t believe they could beat me. (They did, at least in the 701 game.) If they had gotten angry instead, they might have stepped up their game more. Darts is such a mental game and a test of confidence as much as skill, that a shift from “I can’t beat that guy” to “I’ll show him” could have made a lot of difference. The fact is, I was flukey good that night, and I could have followed up my good games with terrible ones, but the Strokes team kept pumping up my confidence. I’m not saying they should have been jerks, but sometimes a little chip on your shoulder can improve your odds of success. I tried to reciprocate with the good vibes. (At least after we had sewn up the division.) Although it’s not unusual for me to give pointers to the other team’s less experienced players, this may have been the first time I’ve ever given an opponent a pep talk during a match. I like these guys, and didn’t want to see them get too down on themselves. (Again, after the division was won.) Of course, I tried to win every game after that, but I didn’t mind seeing them win the 701 game at the end, especially given that the guy who won it shot an impressive score. They’re in the playoffs too, and I’d like to see good guys do well. One final thought about attitude: it’s simply not in my nature to be very demonstrative when I’m throwing well. I don’t go in for shouting or jumping up and down or pumping my fist. I don’t like being in the spotlight, and I don’t like that kind of behavior in others. I also don’t believe in giving the other team any extra incentive to want to beat you. If they like you, it’s harder for them to muster up the killer instinct. That may make my behavior seem more calculated than it is, though. It’s just a positive side effect of what I do naturally. Well, Vulture lived up to his nickname in the first game of the match, where he had me frozen out for several rounds before winning the game himself. It’s hard to get mad at your partner when he ends up winning. Then, as he warmed up (and remember that he didn’t play last week), he really caught fire. There was no respite for the opposition, no weak link to target. If we can play anywhere near this well in the playoffs, we’ll be a formidable team. Final socre: a 9-4 win. We needed to beat Office Cafe 7-6 this week, to keep them from climbing back into contention. 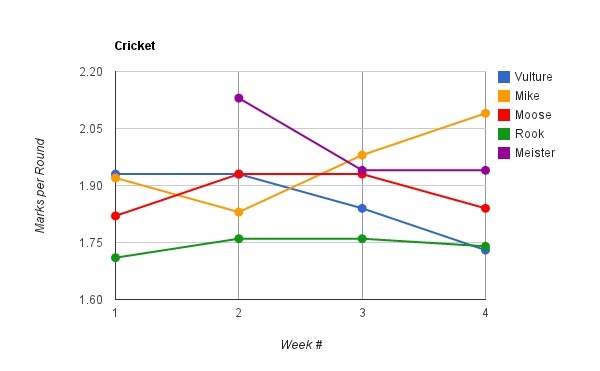 After going up 3-0 in the match things were looking good, but we had a lot of trouble with cricket this week. In the end, we pulled it out and got the victory. Final score: a 7-6 win. Pivotal game: Rook winning the first game of 501 to knock them back on their heels and gain us a little breathing space. Next Tuesday brings us to Tracks to play against Good Strokes, the team just behind us in the standings. No predictions, just math: we have to win 5 games to take first place. (Worst case scenario: three-way tie for first with us winning the head-to-head tiebreakers.) I’d like to get 6 wins to take it outright. This is a fun team to be around. Everybody on it is a good egg, and of course with Moose on their team, it’s hard not to have a great time. It was a shame that two of their players had to leave before the match was over, but we muddled through by letting them grab a spectator–who’s a good dart player not currently on a team–and then throw lefty for the other missing player. And what a great spread! An enormous platter of wings, potato skins, chicken fingers and onion rings heaped on about five pounds of french fries. And the bartender looked like Anna Kournikova even before I started drinking. Final score: a 10-3 win. The sharp-eyed reader will notice that the stats haven’t been updated this week. They won’t, until the season is over in two weeks. The standings here show the changes to our record and Casey’s, but not the other teams. Next up, the biggest match of the year, against our rivals for first place, Office Cafe I. I’d be happy with a 7-6 win, just to keep them from gaining ground on us. Boy, did we ever have the chance to do just that. We had great opportunities to win each of the last two games, but the team just couldn’t get over the hump. Still, it was a solid match. With us losing ground last week after an 11-2 win, I was pleasantly surprised to see that we managed to take over first place this time. Final score: a 9-4 win. This week, we’re at Casey’s. I’m interested to see what’s been going on with their team, because it looks like they haven’t been able to play in a while, and I suspect that their 13-0 loss to the Office Cafe was a forfeit after all. I hope we’ll be able to play. 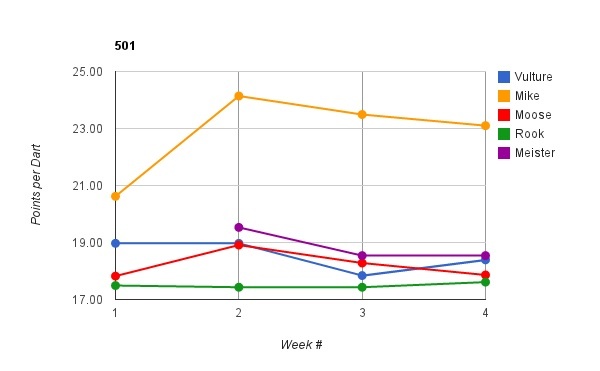 Quite a few of the individual games were close, so the final score was more lopsided than it should have been. In fact, this match was the reverse of our match against Brennan’s earlier this season. In both cases, the winning team was up by at least 9-0 before the other came back to win a few. 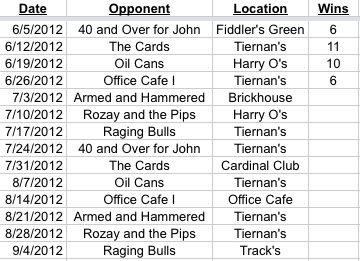 At the time, it didn’t seem like a big deal to lose the last two games, but who would have expected The Office to win their match over Casey’s 13-0? We went into last Tuesday’s match one game back of the lead, we won 11-2, and we still lost ground. Sometimes that happens. Tony and his team played well, and are always a lot of fun to hang out with. And here’s a plug: Tony owns Bradford’s, which is the best bar/restaurant in Stamford outside of Tiernan’s. So if you’re on Bedford Street looking for a place to get a bite and a beer, head on in! I should get a free appetizer for that, right? Final score: an 11-2 win. Next week we play Brennan’s II. They beat us 10-3 at their place and looked unbeatable. I don’t understand how they’re in 5th place, and I’m expecting a tough fight.